The Avonworth chorus hallway, a place that’s typically relatively quiet and calm, was flooded with shouts as Senior Alex “Skippy” Domencic chased a pair of girls down the hallway in pursuit of his stolen hat. “That hat is a legend,” Domencic managed to say when he slowed to a stop. The group was in chorus when the heist took place. Skippy’s hat has been a symbol of his taste in “pop punk” music for years and is now a staple of his school attire, most students not being able to picture him without it. Domencic isn’t alone with his daily ritual. Many other students as well as faculty at Avonworth have a piece of clothing that defines their character. Whether they wear for functionality or for aesthetic, each piece of clothing is an expression of one’s personality or the image they want to put out. For example, Tech-Ed teacher Mr. White is known for his polo shirt and khaki pants. Senior Jagmeet Singh also dons a defining article of clothing each day. His relatively infamous Grass Cutter 12s, a pair of shoes supposedly “forged 3000 years ago and never scuff,” are a daily component to Singh’s wardrobe. 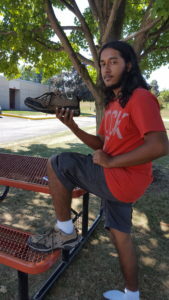 Singh believes these shoes make him different (and perhaps better) than everyone else here at Avonworth, and that they represent to others who he is. “The Grass Cutter 12s aren’t just a staple of my school attire, they’re a staple of my life,” Singh remarks. If you feel that YOU stand out due to one or two fashion trends, add a comment below and an avonewsonline reporter may talk to you about having your own feature.